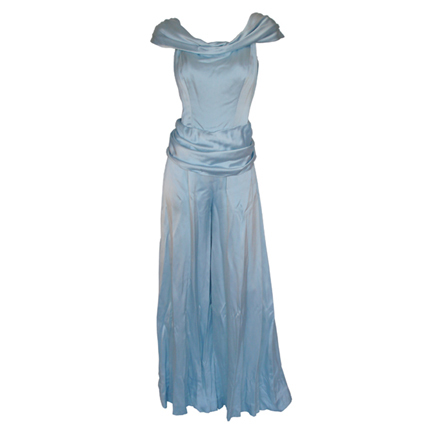 "This blue silk pajama nightgown and matching high heel shoes by Andre #1 were worn by the character Lynn Bracken in the 1997 neo-noir motion picture L.A. CONFIDENTIAL starring Russell Crowe, Kevin Spacey, and Guy Pearce. The actress wore the costume in the pivotal scene where Detectives Jack Vincennes (Kevin Spacey) and Edmund Jennings (Guy Pearce) tail Officer Wendell "Bud" White to the apartment of his girlfriend Lynn Bracken, a high-class call girl who resembles Veronica Lake and caters to clients with a fetish for Hollywood stars. The shoes are seen on the floor of the apartment as the two detectives watch through the window of the apartment as the couple embraces. Also included are a nearly identical pair of blue leather heels by Charles David that were possible alternates not used onscreen. The pajamas and shoes are both in excellent screen used condition and are accompanied by a letter of authenticity from the costume house. Kim Basinger won a 1988 Academy Award for Best Actress in a Supporting Role for her performance in the film. "